The message board here on Clarets Mad that evening was frantic. So was my phone with text messages and emails coming in with congratulations from friends and people I've met and got to know watching football over the years. I've been looking at the emails again only this morning. The first that arrived in my inbox came from Caroline, the niece of former Claret Les Shannon. I never saw Les play but I do know that he scored the goal in a 1-0 win against Hartlepools United (and it was Hartlepools back then) on the day I was born. Through some good fortune I was able to make contact with his family back in 2005 and had the privilege of meeting Les at the end of the 2005/06 season when he came to the 1-1 last game of the season draw against Luton, some eighteen months before he passed away. It was nice to get that email of congratulations from her, just as it had been five years earlier after the Wembley win. "My uncle Les would have been a happy man today," she wrote this time of her uncle who had always retained an affection for the team he played for on 281 occasions between 1949 and 1958. We all had to come down to earth very quickly. We'd still two games to go. We won one against Ipswich and drew the other at Reading. We had a big promotion celebration on the following day when the club went to the Town Hall for a Civic Reception and then travelled back to Turf Moor on an open top bus. Then, disappointingly, came the season ticket news that frankly has flattened the whole thing. The euphoria soon disappeared. It hasn't returned unfortunately, but I felt now was the time to put all that to one side and get back into our minds just what we've achieved as I look back at the 2013/14 season through my very tinted claret and blue spectacles, the ones I've been wearing now for almost 54 years. I suppose the story has to start at Morecambe. 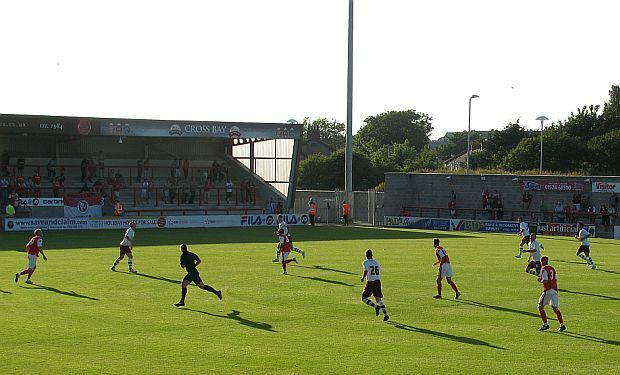 That was where we played our first pre-season friendly last July. When I think of Morecambe I always think of the old jokes about the seaside resort. I've lost count of the number of times I've been told the one about them trying to outdo Blackpool by improving Morecambe illuminations and having the traffic lights change twice as often. I also think about the one man who had the ability to make me laugh more than any other, the one half of a double act who used his home town's name as his stage surname, bringing us sunshine for years until his sad and untimely death in 1984. In terms of football I didn't consider them for many years. They were one of my rival teams when I spent some time as a director of Lancaster City back in the early 1980s but other than that they were a non-league team who we occasionally played in friendlies. We didn't always win either. John Bond's team did in 1984 but Jimmy Mullen and Stan Ternent both took teams there, in 1993 and 1998, and came home with defeats. I don't remember too much about them but I do recall listening to the Nat West semi-final on the radio on the way there in 1998 as Andrew Flintoff and Wasim Akram plundered the winning runs against Notts. Morecambe are a league team now. We played them at their old Christie Park ground ahead of the 2009/10 season, beating them 3-1 with two goals from Steven Fletcher and one from Martin Paterson. A year later and Chris Eagles, Steven Thompson and Kevin McDonald were all on the mark as we repeated that 3-1 scoreline in the Carling Cup, this time at their new ground which is called the Globe Arena. Sean Dyche's team, unfortunately, fell in line with those of Mullen and Ternent, going down to a 1-0 defeat. There was a lot of criticism aimed at the manager. Since the end of the 2012/13 season we'd signed a collection of goalkeepers (do multiple goalkeepers come in collections?) and nothing else. We needed them with all the other goalkeepers having gone but Chris McCann and Martin Paterson had also decided the grass was greener elsewhere, joining Wigan and Huddersfield respectively, and we'd had a few days of major confusion with Charlie Austin. Charlie was going; that we all knew. He wasn't willing to discuss a new deal and, in any case, I think we all understood we needed to sell him to get the money in. By the time the team coach pulled up at Morecambe it was expected that he wouldn't be on it having signed for Hull. He wasn't on it, but only because Dyche had told him to take a couple of days off to get his head round him failing his medical at Hull because of a knee problem, a problem very few would have known about had Steve Bruce kept his mouth shut. Kevin Ellison scored the only goal of the game for Morecambe with ten minutes remaining. Burnley had used 22 players but, other than the goalkeepers, the only new face was Huddersfield midfielder Scott Arfield who was on trial. The whole idea of having Arfield as a potential signing did not go down too well back on the message board but there was news of a potential midfielder signing although the club were keeping very quiet about it. It was David Jones. He'd been released by Wigan and was looking for a club. There was no sign of him at Morecambe. "Rubbish Dyche," was screamed by one irate Burnley fan sat not far behind me in the cheap seats whilst another supporter shouted: "Dyche Out!" as he left the ground. The manager, who had been abused at Blackpool close to the end of the previous season was in need of some better fortune to start turning things round. I got home from Morecambe on Tuesday night; by early Sunday morning I was sat in Manchester Airport ready to board the Air Lingus flight to Cork in the Republic of Ireland where our next game would be played. The next four days on the sun drenched island proved to be very enjoyable. Other than Dublin I'd seen nothing of the country but days out to Kinsale and Cobh were superb as the temperatures soared. Match day was Monday and, for Burnley fans, there was a free pint thrown in if you turned up at the Beer Garden in Evergreen Road, just round the corner from the Turner's Cross ground. Co-chairman John B was in the chair as the Clarets gathered including the manager who said: "I wasn't going to miss this with John B paying for the beer." He mingled, he signed autographs, he posed for photographs (that's Sean, not John) and looked anything but a manager under pressure. He was very relaxed and looking forward to the game. Arfield had travelled with the squad and so had Jones. They were both warming up under the watchful eyes of the coaching staff whilst the Beer Garden had one of its busiest Monday evenings in years as both the Guinness and Beamish flowed. None of us knew at the time but the crucial day in Ireland for our players had already been and gone. It wasn't the game at all but the day that the manager decided to dispense with the footballs and get the tyres out. It was all part of the team building and getting a competitive edge to the squad but most of all it was to get the fitness levels up. Countless times since the players have referred back to that day. They've spoken about it being the toughest day's training they've ever experienced, that they wouldn't want to go through it again, but they've all said how vital it was in getting those fitness levels up. You needed those fitness levels just to cope with the heat that had been thrown at us in Cork. Playing against a team that was in the midst of their league season we had absolutely no problems in securing a 3-0 win. Kevin Long received a warm reception from the home fans at the ground where he played his football before joining the Clarets in January 2010, but the biggest cheer from the Burnley fans was reserved for Austin who was to get his first pre-season game. Danny Ings got the first goal very early in the game. It was the only goal of the first half that, unfortunately, saw Ben Mee have to retire through injury. Dyche hinted that it was nothing serious but it was to rule him out of the start of the league season. In the second half Arfield, one of only two players to play the full 90 minutes, the other being Steven Hewitt, doubled the lead and later in the game we got a third but far be it for me to reveal the goalscorer. From my vantage point it looked as though Keith Treacy had shot into the net but the goal was credited to Sam Vokes. It apparently deflected off the striker's backside. Treacy was none too amused after the game. "He's trying to claim it?" he said of Vokes, before adding: "It's a very big arse." We also got a late cameo appearance from Jones. He hadn't signed but it was always just a matter of time rather than if. It had all been agreed but supporters continued to be worried that he might not sign. I loved my trip to Ireland. Wherever we went we found the people very friendly. 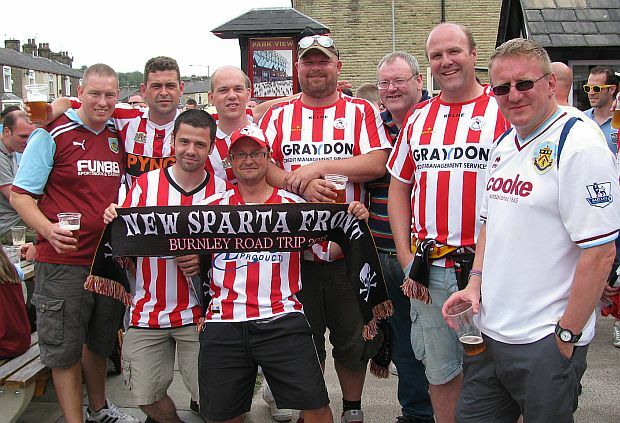 The taxi drivers were like tour guides and once settled we found there were a number of Burnley supporters in our hotel. It was a nice area to explore. I don't recall too much of the game now but I do have some really good memories of the trip. The Guinness was good, and not just the free pint (thanks John), but even now my feet keep reminding me of the route march around Spike Island and the short cut from Cork railway station to our hotel. I'm not suggesting the climb was steep but it felt as though it was vertical as I attempted to avoid taking the longer option. There were some big games still to come. We had our first visit to Carlisle since 1999 and then we were off to Tranmere where we hadn't played a first team game since 2000 although I had been to see Michael Duff's comeback from injury in 2008 when he scored in a reserve game. The first of the two was Carlisle on Saturday 20th July, and there was news of two signing 24 hours ahead of the game. Neither were surprising. Arfield had impressed enough to earn himself a two year deal whilst young striker Ryan Noble, released by Sunderland, had been signed on a short term contract up to the January transfer window. His name had already been picked up and he'd been with us from the start of pre-season. Dyche said of Noble: "We hope to give him a chance here to further his development," and added: "We want him to be hungry to perform and impress and improve himself here. He will get the platform and that is the challenge." He described Arfield as a good talent and said: "He's valued the chance to work hard here. That has deservedly rewarded him with a contract and we hope he continues to build here and turn into a really valuable player for us." So to Carlisle and to be honest I don't have particularly fond memories of the place. I've only seen us win their twice. I've seen it kick off outside the ground on a couple of occasions, once when I was with my young nephew who was frightened to death. Although I remember the game on the Saturday before York in 1992 when I parked up virtually on the M6 slip road such was the congestion as Burnley fans turned up in their thousands, even more than went to York a few days later. 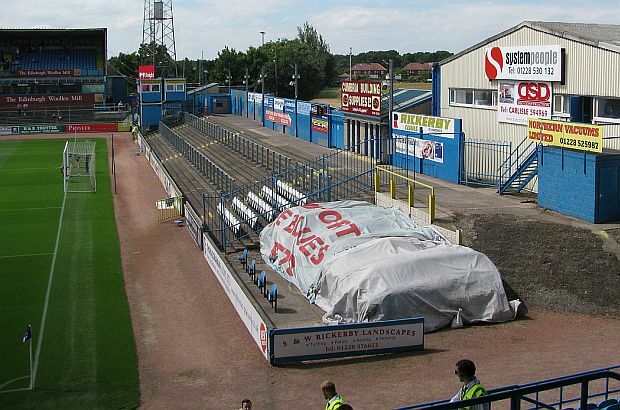 Brunton Park is one of those grounds that was subject to a makeover that got underway and then stopped. It left them with one new stand that isn't quite positioned as it should be and can leave away supporters sat in it on the side but also some distance behind the goal. The temperatures were still soaring and, given past problems between the supporters, the police decided it should be a high profile fixture. The heavy police presence outside the ground, coupled with the aggressive stewarding, made you feel anything but welcome and apparently, for those arriving by train, the station seemed to have recruited a large percentage of the Cumbrian police force for the occasion. It was all unnecessary. There were over 400 Burnley supporters there to boost the crowd but it didn't make two thousand in total to watch us sweep to a convincing 4-1 win. It has to be said that Carlisle were hardly likely to be the best side we would play all season, certainly defensively, but even so our performance was impressive and the victory was fully deserved. There were no goals bouncing in off big arses either. Ross Wallace got the first before Ings bagged himself a brace. It was 3-0 at half time but, as is often the case, the game was disrupted with substitutions after the break but we did get a fourth from Junior Stanislas with a wonderful finish although Carlisle got their consolation almost immediately after that goal. Mee wasn't the only full back missing. There was no sign of Kieran Trippier either leading to wild speculation that he'd been sold. I think by the time we were back on the M6 for the journey home he'd been sold to at least five different clubs. A slight hamstring strain was the real reason for his non-appearance. He would almost certainly have played had it been a league game, and, for the doubters, he was back for Tranmere on the following Tuesday although Michael Duff was now ruled out with injury. I thought this was a tougher game. At the time I could have had no idea that both Carlisle and Tranmere would have disappointing seasons to take them into League Two. Even so, we won again and more convincingly than the 2-1 scoreline suggested. Ings scored again. I described his goal at the time as superb whilst using the word stunning to explain Dean Marney's wonder strike for the second. Duff had a 'little niggle' with Mee having 'that awkward one in Cork' according to Dyche but it was becoming evident that the starting line up for the season's league opener was fast being put in place. Jones had played in the two games. He still hadn't signed. Some were hitting the panic button but there was no need, it still wasn't August. With Duff and Mee out the starting eleven was Heaton, Trippier, Long, Shackell, Lafferty, Wallace, Marney, Jones, Stanislas, Ings, Austin. I was ready to put money on that being the team for the Bolton game unless either or both of Duff and Mee were fit. Some months after the Tranmere game I spoke to Crewe boss Steve Davis. They were due to play Tranmere in their second home game of the season and for that reason he'd gone to the game. He told me that he'd been very impressed with the way we played and had an inkling that his former club might have a good season. Before that season could start there was just one more game to go as we went Dutch and welcomed Sparta Rotterdam to Turf Moor. It's not often we get a Dutch team at Burnley and this was the first since Ajax played us in a post-promotion game in 1992 with players such as Edwin van der Sar and Edgar Davids. Ignacio Tuhnretus scored the only goal of the game that night in front of not far short of 11,000 spectators. For the Sparta game there were 7,000 fewer inside the Turf and our visitors went in front even earlier than Ajax had done 21 years earlier, scoring in just the third minute, although it fairness it was some considerable distance offside, so much so there was a strong belief it had been scored by David Dunn. That was where any comparison between the two games ended as, this time, the Clarets stormed on to a 4-1 victory as the game, like all the others, was played under blue skies and a blazing sun. In the stands there was confusion with the Sparta fans believing they could drink a pint and have a cigarette whilst watching the game, looking quite bemused when told they could do neither. They weren't too impressed with their team either as the Clarets won handsomely. We were level within two minutes of going behind with a power header from Austin. He'd looked a very frustrated figure at Tranmere but this first pre-season goal from our leading goalscorer was just the lift he needed and he went on to have a superb game. Marney got us in front with his second goal in two games and it was soon 3-1 as Ings continued his scoring run with another. Again, as at Carlisle, the heat and changes disrupted things in the second half but Charlie got his second and our fourth to give pre-season a perfect finish with another 4-1 win. The concerns at Morecambe, after just a few days back in training, had by now been banished. Four wins had followed and with the Jones deal expected to go through on 1st August we were all ready for the new season with hopes of maybe bettering the 61 points won in the previous season. We still needed a striker to replace Paterson but other than that we would, as Dyche required, likely be competitive. On the Wednesday night I travelled to Hyde for the development squad friendly. Everything was going well as I got off the train from Manchester and set off to walk to Ewen Fields. That's when the heavens opened and left me absolutely drenched by the time I got there. The staff at the ground were very helpful and at least I got my coat dried but as I sat there damp and feeling sorry for myself I got a text telling me there was a rumour flying round suggesting Austin was going to QPR. A quick phone call confirmed it was on and he left us the following day, just about an hour before we confirmed the Jones signing live on Sky as they toured all 92 grounds. We really had no time to get a replacement in so it looked as though Sam Vokes would have to start against Bolton in the televised opening day game. What a blow. We needed to get a new striker in as quickly as possible. Someone joked that the last time we sold a key player to QPR it was in a season where both clubs were promoted with Burnley finishing above QPR. Lightening doesn't strike twice does it? Ready or not it was kick off time. Bolton were on their way to Turf Moor.